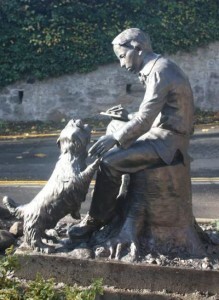 Robert Louis Stevenson was a regular visitor to Colinton, a neighbourhood in the south of Edinburgh, where his grandfather was the minister of the parish. The Colinton Community Conservation Trust has commemorated these visits by installing a sculpture of Stevenson as a boy in front of his grandfather’s church. 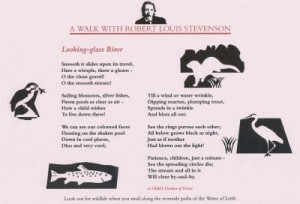 The Trust has also created “A Walk with RLS” following panels showing poems from “A Child’s Garden of Verses” which were inspired by his childhood visits. 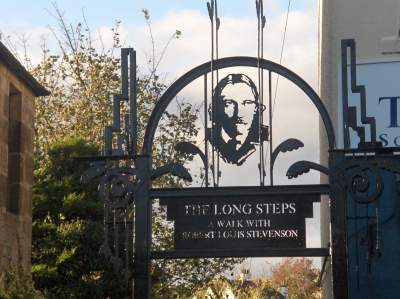 Village walk in the footsteps of Robert Louis Stevenson featuring a Poetry Trail and statue of the young RLS.